I just realized I have been doing a lot of posts on lighting recently, but I think lighting makes all the difference in a room. It's crazy how these lamps came together. 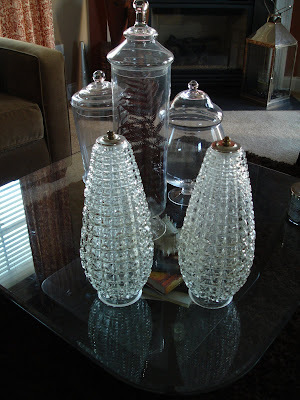 I found these two glass vase-like things at the Goodwill for $2.99. They definitly caught my eye and the fact that they were a pair was even better! I'm really not sure what they are, but would love to find out. Any ideas? They have a fairly large whole in the bottom and a smaller opening at the top. I started thinking about all the wonderful things I could do with them and decided they would make nice lamps for our master bedroom. I had to come up with a way to elevate the base so that the cord wouldn't cause them to sit unevenly. So, I found these two candlesticks at the Goodwill for $1.99 (they were actually at two different Goodwills, believe it or not) I unscrewed the candlestick, leaving only the base. The base had nice feet on the corners leaving an open space on the bottom of it, just what I needed! Then, I primed it (to make sure the paint would adhere) and sprayed it with Valspar Gloss Gray Spraypaint. Unfortunately I don't have a picture of the next thing I bought because I totally forgot to take one. Instead of purchasing a light kit from Lowe's for about $10 I chose to take the cheaper route and buy a couple of lamps from the Goodwill for a couple dollars. I plugged them in and asked for a lightbulb to test them out with to make sure everything was in good working order before I bought them. This step saved me over $15! If you want your cords to match you can actually buy just the cord at Lowe's for about $5. However, I decided to be cheap resourceful and buy two $0.99 extension cords and just cut the "plug in" part (not sure what that's called) off the end of it. Then all you do is strip the outer plastic layer off so you are left with just the bare wires. Putting the lamp back together is pretty easy, you basically just put it together the same way you took it apart. The lamp shades were another great bargain at $2.99/each! (got those from Ross) So, here is the finished product! I just love the detail on the glass. I think it's so unique. I'm so glad I got to come over tonight and see all your amazing creations! The lamp is just beautiful! The picture of it is nice but it's even prettier in person. Thank you! I'm very excited about how they turned out! You are so talented! I am amazed by the things you come up with! That lamp is beautiful. Holy Cow! You are McGyver! I would have never tried to re-wire a lamp. Now I think I should give it a shot. Beautiful! Thank you! Rewiring it was really easy, it sounds more difficult than it is, you should give it a try! 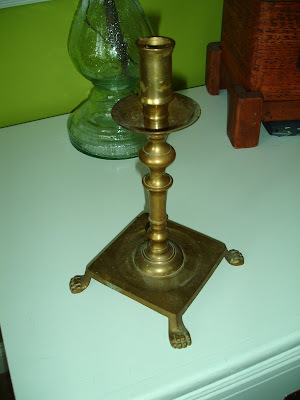 This fantastic lamp is going to be featured tomorrow at the Talented Tuesdays link party at My Frugal Family! 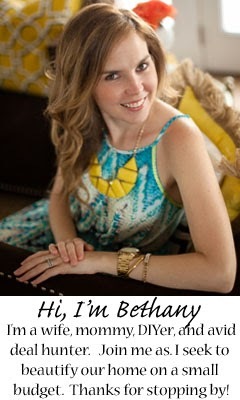 Please feel free to stop by the blog and pick up a "Featured At" button! 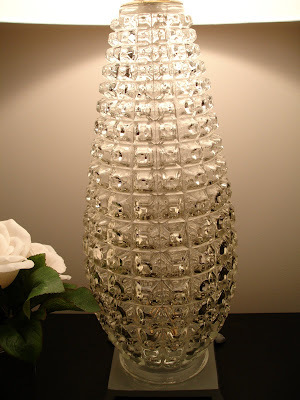 I read this post yesterday & when I went to Goodwill today I saw the exact same glass piece you used for a lamp. I thought that was such an odd coincidence I had to share. 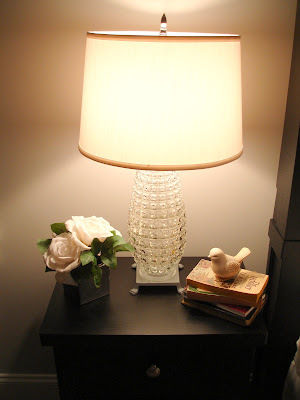 Great idea & your lamps came out fabulous! I keep coming back to these lamps to remind myself to keep my eyes and mind open to random items at thrift stores that I can recreate into something useful and beautiful. You are such a genius!